Eco-friendly cleaning products are also utilized and all the guest rooms, suites and public areas are fitted with energy-saving bulbs or LED lighting. For water conservation, the bathrooms feature low-flow shower heads and faucet aerators. All the toilets have dual flush functions. Plastic bottles are recycled, and grey water is used for the plants in the resort’s gardens. Flora such as bougainvillea trees are not only chosen for their colourful hues, but also for their low water consumption. 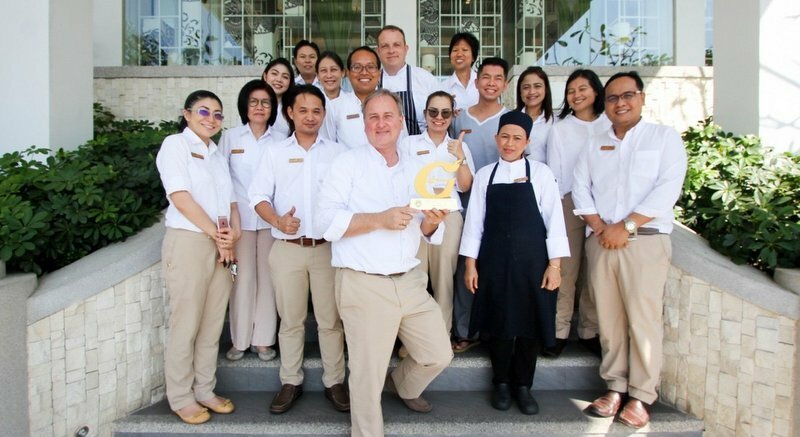 “As one of only three hotels on the island certified to the highest “Gold Level” by the Thai Ministry of Environment’s Green Hotel initiative, we are proud and honored to set a benchmark for sustainability in the hospitality industry on the Phuket,” said Frank Grassmann, General Manager of The Nai Harn. Beyond the rooms, The Nai Harn has replaced all plastic straws with paper straws and also switched all the plastic stirrers used in the hotel bars to glass ones. To minimize the distance between farm and table, the resort team plants and maintains its own on-site vegetable and herb garden. Plants such as Pandanus amaryllifolius are grown for decorative purposes, as well as used as ingredients for desserts. Executive Chef, Mark Jones is also committed to serving sustainable food and focuses on fresh, healthy ingredients that support the livelihoods of local people while helping create and maintain socially and environmentally responsible food production. Outside the hotel itself, the staff team at The Nai Harn regularly organises and participates in environmentally and socially conscious activities and events, including mangrove planting days, and beach clean-ups. “We already have numerous green initiatives in place, but we are looking to implement a range of new CSR activities over the course of 2018 and beyond as we continually strive for ways to lessen our impact on our surroundings,” adds Mr Grassmann. For more information about The Nai Harn or to make a reservation, call 076 380 200-10 or visit www.thenaiharn.com . Guests can also contact reception in real time during office hours using the Live Chat function online.